Hero Training Camp Family VBS puts parents and kids together in the first and last portions of the program. 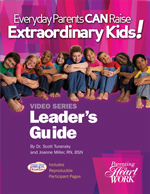 In the middle, children go to the Hero Training Camp VBS portion (see this page for samples) while parents watch the Parenting Training Video Series entitled Everyday Parents CAN Raise Extraordinary Kids. Below you can find samples of the lessons for day 1. 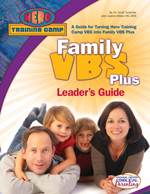 Read a detailed plan of how Family VBS works. Click here. See the complete lesson 1 of Hero Training Camp here. See what's included in the two boxes of Family VBS Plus here. Children rotate through six stations. 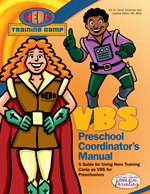 Read a description of how Hero Training Camp VBS Works from the VBS Director's Manual here. Each Station Manager has a detailed description of what to do and how to do it. View all of the Station Manager Summary pages for Lesson 1. Preschoolers have their own version of Hero Training Camp VBS. Some of the terminology and activities are altered to match their developmental level. Read the Preschool Lesson Plans for Lesson 1. 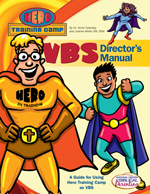 You may order the Hero Training Camp Family VBS Kit to look over for yourself. You'll have 45 days to preview it. If it doesn't meet your needs, you can return it for a full refund of the purchase price.